with halloween coming up, it's time for some isan style campfire tales! mae nak phra khanong is probably thailand's most famous ghost story; based on actual events, the story concerns the tragedy of a young wife who dies in childbirth while her husband is off at war.. the war ends and the husband returns to live with his family, not realizing that they are both long dead. friends try to warn him in vain that he is living with ghosts, only to meet with horrible fates shortly after. eventually the husband realizes the truth and runs to the shelter of the local temple, while his wife's ghost continues to terrorize the community. the spirit still attracts devotees to her shrine off bangkok's th. on nut, where they leave clothing, toys, art or what-have-you for her & her child. 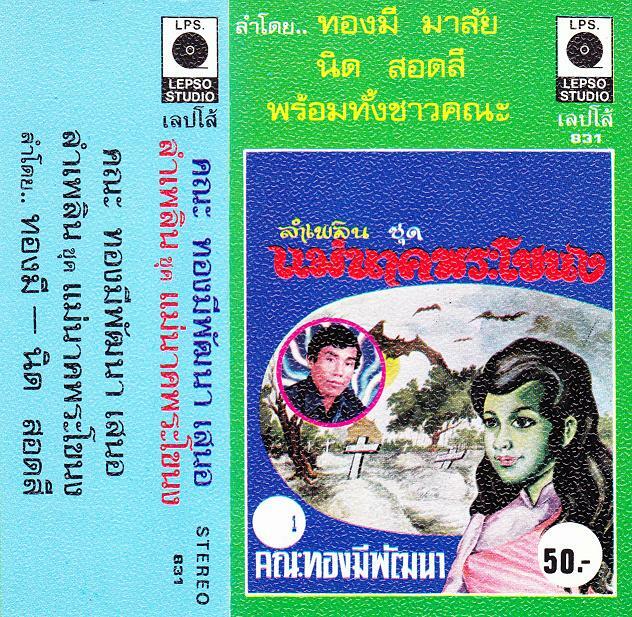 on this cassette, our molam are mr. thongmi malai & ms. nit sotsi from yasothon, backed by the thongmi phatthana band. great stuff! thank you for the heads up Anonymous, although i think you received that message in error... i was just able to download the file with no trouble, and with no such message. maybe just keep trying? if anyone else is having the same problem please let me know! okay, i guess mediafire is having trouble with .rar files. i will upload a new format once i get home today. thanks again for letting me know! switched to .zip, shouldn't be any problems now! ah wow, okay, thanks Rob. it was working for a while... i will try a new file hosting service when i get home tonight! okay the album is up on a new server now! Tong Mee Mailai! He's my favourite, Peter, thanks! !